I'm not sure where to classify this piece. Is it a store display? Is it a prototype? Is it an unproduced prototype? Anyway, this piece was used by Kenner at the 1985 Toy Fair to sell buyers on the concept of the POTF, Droids, and Ewoks coins that came bundled with the action figures that year. This display piece is absolutely huge as the yardstick indicates for scale. 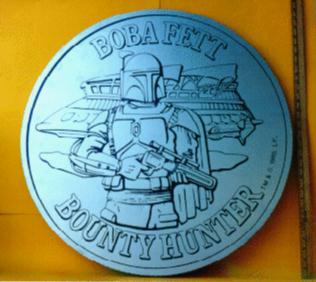 The Boba Fett coin used in this display (shown) here matches the exact artwork used on the POTF Boba Fett coin and the Droids Boba Fett coin. It is a one of a kind piece.